On Monday, Synopsys announced the availability of the industry’s first verification IP (VIP) and source code test suite to support the proposed IEEE P802.3bs/D1.0 Ethernet 400G standard (400GbE). To understand how it will enable next generation networking and communication systems, we take a look at the evolution of the Ethernet. Ethernet was first commercially introduced in 1980. It was originally used to connect personal computers to other computers and shared resources like printers in an office. Ethernet continued to grow to cover campuses and data centers, and then to connect these over metropolitan area networks (MAN) and wide area networks (WAN). This evolution of connectivity followed the 10X speed jumps from the 1980s to 2010 (10M, 100M, 1G, 10G, 40G and 100G) until we reached 100GbE. When the industry saw the challenges of making 100GbE affordable, the industry developed 40GbE as an interim, lower-cost step. 40GbE opened the door for non-10X steps in speed, including 25G, 50G and 400G. Birthing a new generation of Ethernet was quite straightforward in the early years: enterprises wanted faster LANs. Vendors figured out ways to achieve that throughput. IT shops bought the speed boost with their next computers and switches. It is a lot more complicated now with carriers, Web 2.0 giants, cloud providers and enterprises all looking for different speeds and interfaces. Facebook, for instance, said in 2010 that it already had a need for Terabit Ethernet in its data centers. With billions of Ethernet devices in use on networks around the world, it is harder to define a specification that satisfies everyone. Modern networks are built on a hierarchy of devices, with “deeper” switches or routers networking the edge devices together for full connectivity. This has encouraged the use of successively faster trunks as port speeds have increased. More traffic implies more capacity. But traffic does not impact the WAN or LAN uniformly—and therefore the needs may be vastly different in different types of networks. Cloud computing encourages the creation of dense, highly connected data centers. Cloud applications often have more components, and are horizontally integrated than traditional applications, which makes traditional multi-tiered LAN switching performance more problematic. In a cloud data center, even 10 GbE server/storage interfaces connected in a four- or five-layer structure might drive switch interface speeds to 400G or more in the deeper layers. When clouds are created by linking multiple data centers over fiber, a super-Ethernet connection is almost inevitable. This is where we need faster Ethernet switches: to connect cloud data centers and support optical metro aggregation and OTN-based cloud core networks. “The 400GbE development effort, started in the IEEE 802.3 Ethernet Working Group back in March 2013, remains driven by the need to provide higher speed solutions for core networking applications that depend on the aggregation of data.” said John D’Ambrosia, earlier this year in Enterprise Networking Planet. John is the Chairman of the Ethernet Alliance and Chief Ethernet Evangelist in the CTO office at Dell. In November 2013, the IEEE’s 400 Gb/s Ethernet Study Group” approved project objectives for four different link distances of 400GbE. These were approved by IEEE 802.3 Working Group in March 2014. Last week, Facebook announced it is testing a 100 Gbit/second top-of-rack Ethernet switch for its next-generation data centers. Networking hardware vendors, like Cisco, Arista, and Mellanox, already offer 100 GbE switches. As the need for increased bandwidth to support video-on-demand, social networking and cloud services continues to rise, Synopsys VC VIP for Ethernet 400G enables system-on-chip (SoC) teams to design next-generation networking chips for data centers with ease of use and integration. 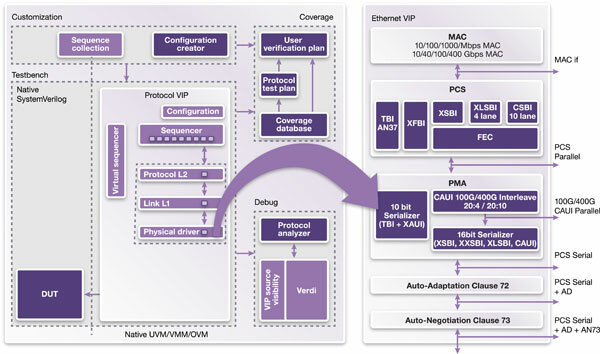 Synopsys VC VIP for Ethernet uses a native SystemVerilog Universal Verification Methodology (UVM) architecture, protocol-aware debug and source code test suites. Synopsys VC VIP is capable of switching speed configurations dynamically at run time, and includes an extensive and customizable set of frame generation and error injection capabilities. In addition, source code UNH-IOL test suites are also available for key Ethernet features and clauses, allowing teams to quickly jumpstart their own custom testing and speed up verification time. Synopsys thus provides a comprehensive Ethernet solution for all speeds, including 25G, 40G, 50G, 100G and the newest 400G standards. You can learn more about Synopsys VC VIP for Ethernet and source code UNH-IOL test suites here. This post is filed under Data Center, Ethernet, Methodology, SystemVerilog, Test Suites, UVM.